PX introduces the new SanStar SSi (Stainless Steel inline) sanitary mixer from its Lightnin brand. As part of the SanStar series, the SSi mixers provide long life and flexible options. They are specifically designed to meet the required standards of the pharmaceutical and biotechnology industries and are provided with an SPX Quality Assurance Documentation package to demonstrate current Good Manufacturing Practice (cGMP). Their performance and sanitary operation, however, also make these flexible machines ideal for food, beverage and dairy applications. The SSi is designed to reduce power loss through the use of high-efficiency planetary gears. It offers a smaller footprint than alternate technologies making it a good choice where space is limited. Overall these innovative new mixers offer great performance and come with a process guarantee from SPX for complete assurance of their operation. Constructed with stainless steel housings and motors, the Lightnin SanStar SSi mixer complies with the latest ASME BPE guidelines, has CE certification and is suitable for a wide range of mixing applications in areas including buffer and media preparation, fermenters, bioreactors, product recovery, bulk pharmaceutical processing and flavor development / blending. The flexible unit is adaptable to installation requirements and is designed for easy maintenance. It is capable of having longer shaft lengths to fit mix-tanks without the need for any in-tank support. Various motor options plus a full spectrum of impeller types are also available to meet a wide variety of tank sizes. Additionally, the SSi will run at variable speeds without speed block out ranges and can be fitted to multiple flange types and sizes. The polished 300 series stainless steel housings are designed to be easily cleaned, provide superior corrosion protection and are suitable for use in clean-in-place (CIP) and sterilize-in-place (SIP) operations. The single, dry-running mechanical seals are available with or without a sanitary purge gland and all seals come with food grade faces and USP Class VI elastomers. 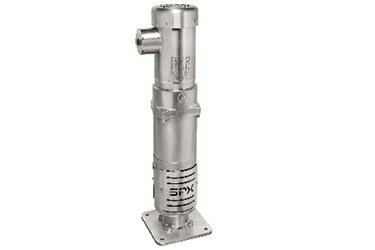 “We are very proud to expand our sanitary offering with the SSi mixer. Flexible installation options and innovative design features aim to reduce the overall cost of ownership through reliable operation and easy maintenance, delivering a high quality solution and great value to our customers”, said Nick Daddabbo, Global Product Line Manager-Portables. Based in Charlotte, North Carolina, SPX Corporation is a global, multi-industry manufacturing leader with approximately $5B in annual revenue, operations in more than 35 countries and over 14,000 employees. The company's highly-specialized, engineered products and technologies are concentrated in Flow Technology and energy infrastructure. Many of SPX's innovative solutions are playing a role in helping to meet rising global demand for electricity and processed foods and beverages, particularly in emerging markets. The company's products include food processing systems for the food and beverage industry, critical Flow components for oil and gas processing, power transformers for utility companies, and cooling systems for power plants. For more information, visit www.spx.com.